In 1851, the schooner America, sailing for the New York Yacht Club, beat the Royal Yacht Squadron and laid claim to its 100 Guinea Cup. Thus the America’s Cup was born – what is now the oldest trophy in international sport – earning its name from that first winning yacht rather than the country, though the US did go on to hold the trophy for 100 years. Where is America's Cup yacht America now? The famous America's cup yacht America changed hands – and names – a few times after the first historic race, and then wound up in the American Civil War as a Union ship. She stayed in the military as a training ship for the Navy until 1873, when she was sold to a former Civil War General for $5,000 (about $98,000 today). The general raced, maintained and refitted the boat, but after his death in 1893, she was passed down to his son who lacked interest in the schooner and allowed her to fall into disrepair. Despite being eventually donated back to the Navy, lack of maintenance left her seriously decayed. The nail was driven into the coffin when a major snowstorm caused the shed she was stored in to collapse in 1945, and America was scrapped and burned, bringing the history of one of the most famous sailing yachts of all times to a close. America’s legacy lives on to do this day, and there are replicas of the schooner you can sail on to relive the glory of this historic vessel. Climb aboard the 32 metre America 2.0 replica (pictured in the inset above) in Key West (November-April) and New York (May-October), or on a 42 metre replica out in San Diego. In 1851, the schooner America, sailing for the New York Yacht Club, beat the Royal Yacht Squadron and laid claim to its 100 Guinea Cup. Thus the America’s Cup was born – what is now the oldest trophy in international sport – earning its name from that first winning yacht rather than the country, though the US did go on to hold the trophy for 100 years. Where is America's Cup yacht America now? The famous America's cup yacht America changed hands – and names – a few times after the first historic race, and then wound up in the American Civil War as a Union ship. She stayed in the military as a training ship for the Navy until 1873, when she was sold to a former Civil War General for $5,000 (about $98,000 today). The general raced, maintained and refitted the boat, but after his death in 1893, she was passed down to his son who lacked interest in the schooner and allowed her to fall into disrepair. Despite being eventually donated back to the Navy, lack of maintenance left her seriously decayed. The nail was driven into the coffin when a major snowstorm caused the shed she was stored in to collapse in 1945, and America was scrapped and burned, bringing the history of one of the most famous sailing yachts of all times to a close. America’s legacy lives on to do this day, and there are replicas of the schooner you can sail on to relive the glory of this historic vessel. Climb aboard the 32 metre America 2.0 replica (pictured in the inset above) in Key West (November-April) and New York (May-October), or on a 42 metre replica out in San Diego. J Class yachts are synonymous with the America’s Cup as these slim, graceful beauties once represented the fleet racing for the Cup. The 36.42 metre Shamrock V, commissioned by Sir Thomas Lipton for his fifth and final bid, she was the first J Class yacht to compete for the Cup. The fact that she is the only J Class yacht to be built in wood makes it all the more remarkable that Shamrock V is still floating today. Where is America's Cup yacht Shamrock V now? The Camper & Nicholsons-built J is in pretty perfect condition for a lady of her years. 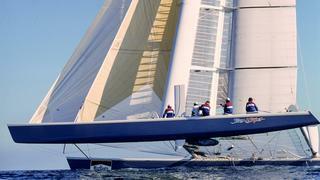 J Class yacht Shamrock V is currently for sale and looking for a good home. The right owner could sail away on this piece of Cup history just in time as the J Class yachts make a triumphant return to the America's Cup. J Class yachts are synonymous with the America’s Cup as these slim, graceful beauties once represented the fleet racing for the Cup. The 36.42 metre Shamrock V, commissioned by Sir Thomas Lipton for his fifth and final bid, she was the first J Class yacht to compete for the Cup. The fact that she is the only J Class yacht to be built in wood makes it all the more remarkable that Shamrock V is still floating today. Where is America's Cup yacht Shamrock V now? The Camper & Nicholsons-built J is in pretty perfect condition for a lady of her years. 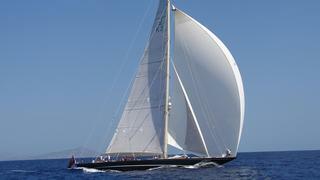 J Class yacht Shamrock V is currently for sale and looking for a good home. The right owner could sail away on this piece of Cup history just in time as the J Class yachts make a triumphant return to the America's Cup. While the film Wind, one of the best boat movies, was inspired by Dennis Conner’s experience competing for the America’s Cup in 1983 on board Liberty, the yacht that was actually used in filming was the 12 Metre type sailing yacht Stars & Stripes 87. She was called Geronimo in the film, but Stars & Stripes 87 was more than a screen legend. When Conner launched his own campaign, he wanted a culmination of all the Stars & Stripes yachts that came before her, and she was designed to be fast in heavy air. Stars & Stripes 87 wound up being the final 12 metre yacht to win the America’s Cup. Where is the America's Cup yacht Stars & Stripes 87 now? Stars & Stripes 87 can be found in the Caribbean now, able to be sailed with the St Maarten 12 Metre Challenge, giving you a chance to take the helm (if you're lucky) of a real Cup winner. While the film Wind, one of the best boat movies, was inspired by Dennis Conner’s experience competing for the America’s Cup in 1983 on board Liberty, the yacht that was actually used in filming was the 12 Metre type sailing yacht Stars & Stripes 87. She was called Geronimo in the film, but Stars & Stripes 87 was more than a screen legend. When Conner launched his own campaign, he wanted a culmination of all the Stars & Stripes yachts that came before her, and she was designed to be fast in heavy air. Stars & Stripes 87 wound up being the final 12 metre yacht to win the America’s Cup. Where is the America's Cup yacht Stars & Stripes 87 now? Stars & Stripes 87 can be found in the Caribbean now, able to be sailed with the St Maarten 12 Metre Challenge, giving you a chance to take the helm (if you're lucky) of a real Cup winner. Paving the way for the high-performance multihull America's Cup yachts that are redefining the competition is Stars & Stripes – the catamaran. The first America's Cup multihull yacht, the US team's Stars & Stripes came to be by a cunning interpretation of the Deed of Gift, which only stipulated the challenging yachts be single masted and no more than 90 feet LWL. The result was anything but a true match race, with the much faster, wing-masted multihull Stars & Stripes winning the Cup in 1988. *Where are the America's Cup multihull yachts Stars & Stripes now? * Two versions of the multihull Stars & Stripes were built, a soft sail (S1) and a wing-masted yacht (H3). Stars & Stripes (S1) was acquired by American entrepreneur Steve Fossett and used to set speed records around the world before being sold in 2017 to Key Lime Sailing Club and Cottages in Key Largo, where she is used for day charters and racing. The actual Cup player, Stars & Stripes (H3) was bought by Mark Reece in Naples, Florida and was used for sailing charter trips, but her current status is unconfirmed. Paving the way for the high-performance multihull America's Cup yachts that are redefining the competition is Stars & Stripes – the catamaran. The first America's Cup multihull yacht, the US team's Stars & Stripes came to be by a cunning interpretation of the Deed of Gift, which only stipulated the challenging yachts be single masted and no more than 90 feet LWL. The result was anything but a true match race, with the much faster, wing-masted multihull Stars & Stripes winning the Cup in 1988. Two versions of the multihull Stars & Stripes were built, a soft sail (S1) and a wing-masted yacht (H3). Stars & Stripes (S1) was acquired by American entrepreneur Steve Fossett and used to set speed records around the world before being sold in 2017 to Key Lime Sailing Club and Cottages in Key Largo, where she is used for day charters and racing. The actual Cup player, Stars & Stripes (H3) was bought by Mark Reece in Naples, Florida and was used for sailing charter trips, but her current status is unconfirmed. America’s Cup yacht Stars & Stripes (sail number 34) is probably most famous for not winning a Cup. It wasn’t because she didn’t perform under pressure, but because she never got the chance. 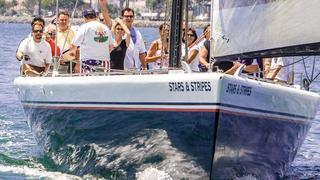 While the 24 metre yacht, designed by David Peddic and built in 1994 by Goetz Boat Works, won the right to defend the Cup, Dennis Conner chose Young America (US 36) over Stars & Stripes. The new choice was no match for Team New Zealand’s Black Magic, which beat out Team Dennis Conner four times in a row. Where is America's Cup yachts Stars & Stripes (US 34) now? Famed America’s Cup Stars & Stripes (US 34) is earning a chance to prove herself on the racecourse yet again. She sails out of Chicago, racing against Abracadabra (US 54). After failing to win the Cup in 2000, this iteration of Abracadabra was bought by Larry Ellison, who used her as a training boat for his Oracle Team USA. America’s Cup yacht Stars & Stripes (sail number 34) is probably most famous for not winning a Cup. It wasn’t because she didn’t perform under pressure, but because she never got the chance. While the 24 metre yacht, designed by David Peddic and built in 1994 by Goetz Boat Works, won the right to defend the Cup, Dennis Conner chose Young America (US 36) over Stars & Stripes. The new choice was no match for Team New Zealand’s Black Magic, which beat out Team Dennis Conner four times in a row. Where is America's Cup yachts Stars & Stripes (US 34) now? Famed America’s Cup Stars & Stripes (US 34) is earning a chance to prove herself on the racecourse yet again. She sails out of Chicago, racing against Abracadabra (US 54). After failing to win the Cup in 2000, this iteration of Abracadabra was bought by Larry Ellison, who used her as a training boat for his Oracle Team USA. Sailed by the US challenging team in preparations for the 2003 America’s Cup in Auckland, New Zealand, USA 76 never made it to the Cup, but she came quite close. Making it to the Louis Vuitton America’s Cup final, USA 76 faced the Swiss Team Alinghi but didn’t come out on top. So the US team arranged for a “rematch” against Alinghi, with two races set in San Francisco Bay. While it didn’t change the results of the Cup, this time USA 76 bested the Swiss competitors twice over. Where is America’s Cup yacht USA 76 now? 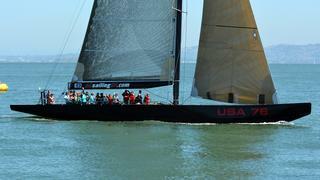 Fittingly, USA 76 resides in San Francisco Bay and is available for sailing. Capture the spirit of the most recent America’s Cup that was raced in the natural amphitheatre of the Bay by climbing aboard USA 76 for a racing adventure under the Golden Gate Bridge. Sailed by the US challenging team in preparations for the 2003 America’s Cup in Auckland, New Zealand, USA 76 never made it to the Cup, but she came quite close. Making it to the Louis Vuitton America’s Cup final, USA 76 faced the Swiss Team Alinghi but didn’t come out on top. So the US team arranged for a “rematch” against Alinghi, with two races set in San Francisco Bay. While it didn’t change the results of the Cup, this time USA 76 bested the Swiss competitors twice over. Where is America’s Cup yacht USA 76 now? Fittingly, USA 76 resides in San Francisco Bay and is available for sailing. Capture the spirit of the most recent America’s Cup that was raced in the natural amphitheatre of the Bay by climbing aboard USA 76 for a racing adventure under the Golden Gate Bridge.